More than 40,000 people under the age of 65 have been diagnosed with dementia in the UK, 3,200 of those in Scotland. It is estimated that 18% of them continue to work after a diagnosis and therefore this is a growing workplace issue that employers and unions should be addressing. Today, I was speaking at a seminar organised by the STUC, Age Scotland and Alzheimer’s Scotland, aimed at raising the profile of the issue and building alliances to improve awareness and action. The number of people with dementia is forecast to increase to over 1 million by 2025 and 2 million by 2051. Not least because of the increase in the retirement age and poor UK state and occupational pension provision - a greater number of people are expected to work later in life. As the lead negotiator for the largest pension scheme in Scotland, the most common question members asked me was, ‘how I can retire early?’ Now, they are just as likely to ask about working on past the normal retirement age. This driven by many factors in addition to increasing the normal retirement age. In local government many members have short service – the average is ten years. Contrary to the media myth of the 'gold plated pension' the average pension in payment is only £3705 per year. Many women in particular need to work on to build up a decent pension after career breaks and a number of men come into the public service workforce later in their career. We also have an ageing public service workforce with 50 to 59 year olds the biggest growing proportion. 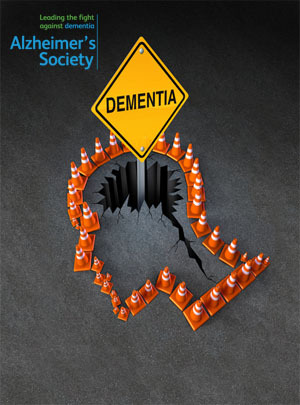 To help us address this issue, we have a very useful guide from the Alzheimer's Society, which UNISON contributed to. This guide sets out practical advice about how to spot the signs and symptoms of the illness. It also explains how to support people with dementia - giving them choice and control of their lives, and allowing them to continue to contribute their skills and experience to the organisation. This can not only make a difference to affected staff, but bring benefits to the whole organisation. The business case includes improving staff retention and providing a more inclusive service - which itself, evidence suggests, can enhance productivity and performance. A dementia diagnosis doesn’t necessarily mean a person can no longer do their job. However, dementia is a progressive condition and over time it will increasingly impair a person’s ability to work. By becoming dementia friendly, organisations will further develop a culture that understands and supports all staff and enables them to work in a way that suits them and meets the organisation’s needs. Union reps should use the guide to make themselves aware of the symptoms of dementia. Only 48% of people with dementia in the UK are diagnosed and people with early onset dementia can face particular delays receiving a diagnosis. There is a perception that only retired older persons suffer from dementia, so this might not be the first thing a steward thinks of when representing a member. There's also the question of legal compliance. People with a disability are protected under the Equality Act 2010, and generally this will include people living with dementia. This means that employers have a duty to make reasonable adjustments for staff with dementia so that they are not disadvantaged at work. Adjustments could include clear signage and labelling, creating quiet spaces, and installing soundproofing or putting up visual barriers to minimise distractions. They might also entail a review of current job specification, reallocation of duties, a change of working hours, or redeployment to another role. An older workforce will bring a number of challenges and opportunities and dementia is one of those. Unions and employers need to address these issues urgently. Organisational culture takes a long time to shift, so raising awareness and then training for managers and union reps should be an early priority. We understand that the Council Tax is a difficult issue for politicians, but this latest sticking plaster isn't the solution. I was giving evidence to the Scottish Parliament’s Local Government Committee this morning on the secondary legislation implementing the Scottish Government’s latest tweak to the Council Tax. These involve increasing the higher bands, ending the freeze and changes to the reduction scheme. More details in my briefing. Increasing the multipliers for the top bands is a modest progressive move. However, it still leaves those in a £212,001 home paying the same bill as those in a million pound one. The Commission on Local Tax Reform indicated that the tax on highest value homes would need to be 15 times that of the lowest value homes in order to achieve proportionality. The current system means a £400K house pays three times as much as a £40K house - not ten times. This means that like VAT, it takes up a bigger proportion of low income households than high. This chart compares the impact of the Commission’s proposals with the Scottish Government’s plan. The government also needs to clarify how it expects water charges to be treated under the new bands. In addition, there is to be no revaluation, so the new bandings will be based on 1991 property values. That simply isn’t credible when 57% of properties are in the wrong band. No one doubts that revaluation is politically challenging, even if there are likely to be equal numbers of gainers and losers. It could also introduce transitional provisions. The question is, just how long does the government intend to avoid revaluation before biting the bullet? A bigger problem is that the Scottish government has decided to take the additional revenues, estimated at £100m, to allocate to their priorities – a new form of ring-fencing. Similarly, they have capped increases to the Council Tax at 3%. Both of these measures undermine local democracy. Any improvements in the council tax reduction scheme will be welcomed by low income households. However, this cost used to be met by central government, not councils, who lose £333.2m through the system. This means the plan appears to impact on the income of councils with the most low income people. These people may well also find that any savings made on their council tax bills will not make up for cuts in the services they use or extra charges for those services. Charges now make up almost 7% of council budgets while council tax revenue has shrunk to around 15%. All of these changes need to be effectively communicated to the public; otherwise it will be front line staff that take the flak for the confusion. Setting up a fair property tax and rate that reflects the real values of properties is what will make the system fairer. We also need to design a system for those who struggle to meet their property tax obligations because of low incomes, which doesn’t unfairly impact on the budgets of local authorities with disproportionate numbers of low income citizens and deferment opportunities for the small group of property rich, cash poor pensioners. While we welcome the end of the council tax freeze and improved bandings - we simply cannot go on with short-term fixes that damage services and undermine local democratic accountability. The one fact that has to be recognised is that Jeremy Corbyn won the leadership ballot emphatically. He won in all three parts of the selectorate and he won on a higher rate of participation. His victory was all the more remarkable given the vitriolic campaign against him in the media. Even normally progressive papers like the Guardian use value based language like ‘moderates’ to badge his opponents. I am usually the last to attack the BBC, but as the Media Reform Coalition report shows, it is justified on this occasion. Twice as much airtime was given to critical voices and BBC reporters regularly use pejorative language when describing Jeremy and his supporters. After the ‘coup’ failed, it was always unclear to me why the plotters continued with a leadership challenge. If as Andrew Rawnsley suggests, “it was to take the shine of the incumbent”, it failed dismally. Rawnsley, himself a Corbyn critic, explains why. Most party members, including myself, were appalled by the behaviour of the PLP at a time when we should have been attacking the Tories. Whatever the reservations about aspects of Jeremy’s leadership, we were not going to reward bad behaviour. There has been a lot of coverage of the role of Momentum, but much less about Progress. I am not a member of either, but I accept that Momentum is at least an open and transparent movement, something that cannot be said for Progress. Again, the BBC did not cover itself with glory with its botched documentary. On the issue of ‘The Purge’, I have to say that I have seen no examples in Scotland of members who were suspended without due cause. However, when you look at the voting numbers there does appear to be cause for concern, particular at the turnout of registered supporters. There must be greater transparency over this matter and the application of the rules of natural justice. Suspension letters that I did see were not of the standard we would expect in any walk of life. Research amongst party members undertaken by Queen Mary University has highlighted some interesting views. They found that party members, old and new, shared a common vision of what the Labour Party should stand for. They also found that Party members have been longing for someone like Jeremy, long before he was on a ballot paper. Newer members are more likely to feel politicians are estranged from them, but the big difference is over their view of leadership. Fewer than half (42.5%) of old members said they had been driven to join because they believed in the party leadership. More than three quarters (76.5%) of the post-May 2015 members said this had been a driving factor. Rising to 82% among those who joined during the 2015 leadership election and to virtually everyone who joined afterwards. As far as Scottish Labour is concerned, the most important part of conference was passing the rule changes that give significant autonomy to the party in Scotland. The SEC will be responsible for the procedures and selection of all UK parliamentary candidates in Scotland and for the management of constituency Labour parties in Scotland. Scottish Labour will also have full control over policymaking, including for the first time in reserved policy areas. These are very big changes. It’s not an independent party because members clearly rejected that option – rightly in my view. For those who think they are minor, just look at how certain sections of the UK party hierarchy resisted them! A frontbench member of the Scottish Parliament, nominated by the Scottish Labour leader, will also directly represent the Scottish Labour Party on the NEC. This was not part of the joint SEC/NEC working group’s proposals, but it does regularise an arrangement that has been in place for several years and is therefore consistent with the tidying up elements of the rule changes. Personally, I am not convinced that there needs to be a seat on the NEC, given the new levels of autonomy, but I am equally unconvinced about direct elections with limited accountability. The measure only became contentious due to Kezia Dugdale’s unwise intervention in the leadership ballot - Carwyn Jones used better judgment. So where do we go next? I thought Owen Jones struck the correct note in his ‘critical friends’ approach. Members will expect the PLP to accept Jeremy’s mandate, recognising that you can express dissent without damaging the Party. If Labour’s right wing had an obvious route to power they wouldn’t be in such a parlous state. Equally, mandatory reselection is not the way forward – the current rules are perfectly adequate. Jeremy now needs to set out a coherent vision on the big issues of the day and communicate it effectively. As Gary Younge says; “Principle and pragmatism are not mutually exclusive, and neither side owns a monopoly on either. Political parties do need to win elections, but they are more likely to do so if they stand for something more than just power”. That’s a circle the Labour Party has joined up before and can do so again. If there is one post-Brexit growth area, it is conferences on how to deal with it! The Centre on Constitutional Change at least does it better than most, and they gathered together a good range of speakers in Edinburgh today. The conference started with a political panel. Parties set out their position, as far as they good. Phrases like 'the best possible deal' are pretty meaningless when we have no clear idea what the UK's negotiating strategy is - or even if the cabinet could ever agree on one. There was a recognition by most of the politicians that these negotiations will be difficult, with no appetite in Europe for some sort of sweetheart deal. The only common ground is that it isn't going to be quick and we have to keep an eye on elections in Europe, not least in Germany. There was a helpful focus on what the repatriated powers mean for Scotland. This included a discussion on how repatriated EU funds are allocated. If it's just by Barnett, Scotland could lose out. Also some consideration of the opportunities as well as the threat, recognising that the EU is not a perfect institution as its response to the financial crash and the refugee crisis has shown. The academic contributions started with Laura Cram who talked about Brexit from an EU perspective. She started with the scary fact that the most googled phrase the day after the referendum was - 'what is the EU?'. She reminded us that the other countries of the EU have their own interests and electorates. While there may be no wish for a punitive approach - there is a concern about contagion and don't forget those countries outside the EU who have relationships with the EU. David Bell set out the stark problem of the trade off between free trade and free movement. There will be different positions in Europe on these issues. For example, remittances from migrant labour are important to East European countries and trade is more important for countries closest to each other. A free trade deal with Australia isn't a substitute for the EU! The EU is not particularly happy with the Norway and especially the Swiss deal. Interestingly, CETA has a sub-state arrangement for Quebec. Trade deals are generally struggling at present, as the debate over TTIP shows. Christina Boswell believes some kind of trade off may be possible between free trade and free movement. There are precedents for caps and temporary stops on migration. The stumbling block is political as far as the UK voters are concerned, or 'cake and eat it' from the EU perspective. If hard Brexit the UK then has to design a migration system. She reminded us that the UK government has such controls in place for non-EU migration and has failed to meet their own targets. Not least because of the business pressures for immigration. Paradoxically leaving the EU could damage the economy and that is the most effective way of reducing immigration! While it would be legally possible to deport EU citizens who have permanent resident status in the UK, it would be very difficult politically and practically. The U.K. Government stance is more about avoiding an immigration pull effect before Brexit happens. Michael Keating explored the possibilities for Scotland remaining in the EU. In short, that's a no. Almost nobody wants a hard border with rUK, the consequence of most options. There are a number of ways that Scotland can continue to have a loser networked relationship - taking more of an EU than UK line on issues like environmental regulation, universities and the social contract. Scotland's approach to social and economic policy is arguably closer to the EU than many in the cabinet, who may want to pursue a race to the bottom offshore model. David Heald warned that we may still get the punishment budget in the Autumn Statement because right could use Brexit as the latest excuse to reduce the size of the state. On the other hand, economic pressures could drive some easing of austerity. Scottish farm incomes are more dependent on EU subsidies than rUK and therefore we should focus on how money is allocated. Similarly, with university research funding. There are also fiscal opportunities. For example, outwith the EU, Scotland could have different VAT rates and goods and services in scope. Brexit is also happening at the worst time for Scotland, before the new devolved financial powers have settled down. Alan Page outlined the range of constitutional implications. Brexit has no direct impact on powers of Scottish Parliament, the law remains the same. The difference is that parliament will be able to legislate on the EU competencies, not just implement Directives. However, most of these are reserved. He questioned how much divergence there will be, given international commitments in areas like the environment. Divergence and the need for an LCM gives an opportunity for a renegotiation of devolved powers. He also pointed to the loss of EU judicial oversight. A good example is the challenge to minimum price of alcohol. Ailsa Henderson spoke about people's attitude to risk. People more tolerant to risk voted to leave the EU. They believe there is less risk to the economy than to immigration. Polling shows that Scots are as Eurosceptic as the rest of the UK, they just draw different conclusions on Brexit - more critical friends. Opportunities for engagement is one way to get over losers significant loss of satisfaction over the process of democracy. Finally, Nicola McEwen focused on implications for further devolution. For example, the First Minister has talked about maintaining protections in employment law and Scotland's need for immigration - both of which are largely reserved. Even external relations could be on the agenda. Belgium has provisions for devolved areas to have limited competencies in foreign affairs. Another option is some form of co-decision making. As always when discussing Brexit we are left with more questions than answers. However, this conference flagged up some new issues for me and questions are at least a start towards sorting out the mess we are in. P.S. If you want more on Scotland and Brexit, Holyrood Magazine are running a series of short briefings. I'm speaking at the one on health this Thursday. As a new Oxfam report has highlighted, the richest 1% of Britain’s population owns almost more than 20 times the total wealth of the poorest 20%. Or put another way, 634,000 of the wealthiest people are worth 20 times as much as the poorest 13 million. This makes Britain one of the most unequal countries in the developed world. This 'us and them' society is illustrated by a story in today's Guardian. The disgraced former owner of BHS, Dominic Chappell, owes more than £500,000 to the taxman on the profits he made. HMRC has started legal proceedings to recover the money. However, Chappell has put the business that owes the tax, Swiss Rock Limited, into liquidation, meaning he could walk away without paying the bill. Truly, only the 'little people' pay taxes. We also have some more detailed data on disposable income, helpfully analysed by SPICe in their latest briefing. Disposable income per person in Scotland is currently £17,905. This is just below the UK figure of £17,965. Scotland has the 5th highest GDHI per person of all UK regions. Between 2013 and 2014 Scottish GDHI per person grew by 0.2% in cash terms. This is lower than the increase across the whole of the UK (0.5%). Taking a longer time frame is interesting. Between 1997 and 2014 Scottish GDHI per person increased by 28% (£3,740) in real terms with the UK seeing a 27% (£3,830) increase over the same period. The gap between Scottish and UK GDHI per person has decreased from a peak of 8.6% in 2000 to 5.1% in 2014. This is one statistic that we can't put down to the oil price crash. Unsurprisingly, London has the highest disparity between the highest and lowest GDHI per person in the UK. Scotland in comparison is a more equal society, at least in terms of disposable income. However, there are significant inequalities within Scotland. 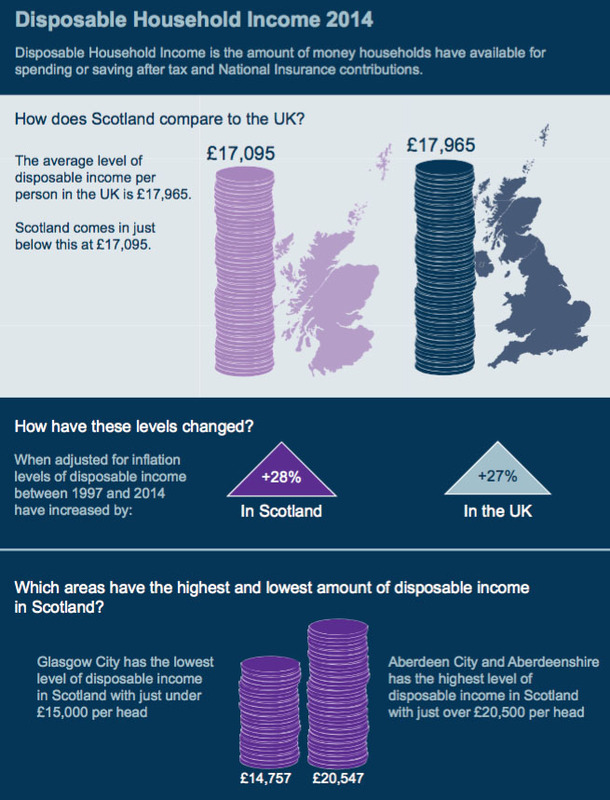 Aberdeen and Aberdeenshire has the highest level in disposable household income at £20,547, followed closely by Edinburgh. Glasgow City is the lowest at £14,757. East and North Ayrshire saw the largest increase in GDHI per person last year while East and West Dunbartonshire saw the largest decrease. The GDHI figure is broken down into primary income ( wages, assets etc) and secondary (benefits, pensions and gifts). Scotland has the sixth highest level of primary income of the U.K. regions and accounts for 7.8% of all primary income in the UK, but 8.3% of total UK population. Only London, south-east and east of England outperform their population share. Scotland has the highest proportion of income from wages of total income and the second lowest proportion of rental income and self-employment. Since 2008 all types of primary income have decreased in real terms in Scotland, but financial assets have declined the fastest, probably due to low interest rates. Scotland accounted for 8.4% of the total income from benefits which is almost exactly the same as Scotland’s population share of the UK (8.3%) and are fourth from bottom in this 'dependency' league table. Interestingly it is areas like, Lochaber, Skye and South Ayrshire that have the highest secondary incomes. This is probably due to pension income and reminds us where the bulk of the welfare budget is actually spent. So, this data shows that income inequality in the UK remains a huge issue for concern. Scotland is a more equal country, but still has big geographical differences. The question for policy makers is how should these disparities be tackled. Unequal countries do worse on almost every count, so we should focus on progressive taxation and stronger public services to bridge the gap. The energy story of the week is the decision to go ahead with the Hinkley nuclear power station. 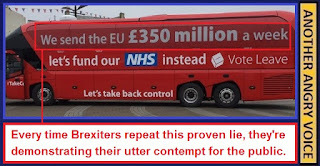 Theresa May's grand review of the project, turned out to be a case of the Grand old Duke of York, marching sceptics to the top of the hill, only to march them down again with the flimsiest of assurances. George Monbiot, writing in the Guardian got it just about right. Nuclear power can make a useful contribution to a balanced energy policy, but Hinkley is an expensive white elephant. There are serious doubts over the design and the cost is prohibitive. As Dave Vince of Ecotricity puts it; "it's just a bonkers thing to do really, particularly when we have so many clean alternatives which are cheaper, faster, cleaner in wind, solar, tidal, wave, and energy efficiency even.” He pointed to a study which suggested that £1 billion spent on energy efficiency could cut energy consumption in half. Meanwhile, £18 billion is likely to be spent on the construction of Hinkley. However, nuclear power is a low-carbon energy source, roughly comparable to renewables in terms of total emissions. Replacing fossil fuels with renewables, on the timescale in which we need to act, is hard enough, without setting the additional, unnecessary challenge of also replacing nuclear power as some environmental groups advocate. A more viable alternative might be small modular reactors (SMRs). It is argued that these offer a form of secure, low-carbon energy, the cost of which is comparable to, if not lower than, larger reactors. They also have smaller up-front costs, shorter build times and the option to gradually scale up capacity. However, they will have to overturn a key principle which has historically underpinned nuclear reactor design – economies of scale. All of this is pretty academic in Scotland because no one is going to waste time and money battling against the Scottish Government's opposition to nuclear power. They can build in England and transmit the power to Scotland, when the wind isn't blowing. However, we should remember that existing nuclear power stations still power a third of electricity generation in Scotland. The right-wing think tank, Reform Scotland, this week published a paper by Stuart Paton, 'Power of Scotland'. He argues that the proposed power stations at Hinkley Point and Sizewell in England would generate 6.4MW of power, equivalent to the entire capacity of all the current windfarms in Scotland, without the damaging environmental impact of wind farms. He also argues that the cost difference isn't valid because the agreed strike price at Hinkley Point of £92.50/MWhr compares favourably with £95/MWhr for onshore windfarms and £155/MWhr for offshore windfarms. However, this conveniently ignores the fact that renewable prices are falling. He does make the valid point that public opinion in Scotland isn't as anti-nuclear as we might think. Sadly, an otherwise decent analysis of energy needs in Scotland is undermined by his advocacy of fracking. He fairly criticises the contradictions in the Scottish Government's policy of supporting oil and gas, but not fracking - but then makes similar contradictions by supporting carbon-free energy production and a dirty emission producing process like fracking. He is certainly right to criticise the UK government's decision to abandon CCS and to support a greater focus on energy efficiency. He is right that Scotland has to develop its energy policy beyond a fixation on wind power and point scoring with Westminster. However, this package of contradictory polices isn't that alternative. The key to delivering high quality social care in Scotland is a fairly paid, well-trained workforce that is given the time to care properly. Today, I was giving evidence to the Scottish Parliament Health Committee on the social care workforce. The committee has been looking at how the new Integrated Joint Boards have been coping with the challenges facing them. Unsurprisingly, new structures take time to settle down and even agreeing budgets has been problematic. The NHS needs better social care to tackle delayed discharges from hospital beds. 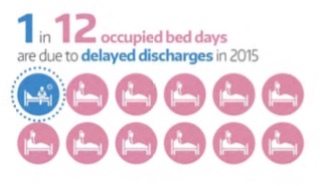 Delayed discharge patients occupied a staggering 567,853 bed days last year, that’s one in twelve beds in NHS Scotland, costing around £114m. These figures mask a human tragedy for many elderly people who want to be in their own home, or even a residential setting, rather than in a hospital bed. The Health Committee’s survey showed that just four of the 31 Integrated Joint Boards have adequate numbers of care staff to get these patients out of hospital. That reflects our own experience; with social workers reporting that it is becoming increasingly difficult to get providers to staff care packages. One senior social worker told me last week that she rang five providers and none could provide staff for an elderly person due to be discharged from hospital on the following Monday. She had to go on bended knee to the much-reduced in-house team to get a temporary solution. We are seeing some very high staff turnover rates from even the better providers. This matters because it is expensive to keep recruiting and training new staff. Elderly persons want continuity of care - seeing a different carer each week is very poor practice. 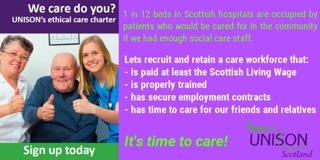 The quality of care is starkly reflected in UNISON Scotland’s latest survey of home care staff, ‘We Care, Do You?’ Workers describe some pretty appalling practices that none of us would want for their elderly relatives. So what’s the solution? In fairness to the Scottish Government they have at last recognised that we have to resource social care properly. Years of council cuts have led to a race to the bottom in pay and conditions for these workers and short cuts in care delivery. Even inadequate 15-minute care visits become 10 minutes because they often don’t take account of travelling time. Just increasing capacity isn’t enough either. If providers can’t recruit and retain staff, the new care packages will only exist on paper and patients remain in hospital. £250m was allocated this year to improve social care, although it was routed through the NHS, when it is councils that deliver social care. This may make NHS funding look more impressive cosmetically, but it contributes to ‘the guddle’ as I described it in the Sunday Herald. There was never any transparency over the constituent elements of this money and in particular how much was allocated to ensure the Scottish Living Wage is paid to care workers from 1 October – an essential element of the policy. Just a few weeks before the policy is supposed to be implemented, councils and providers are struggling to get the procurement policies in place. Providers say there isn’t enough money; councils say that’s all they have received. We are also concerned that some providers may well pay the correct wage, but will cut back on other terms and conditions. This is contrary to the statutory procurement guidance that refers to all workforce matters – not just pay. Much of this could be avoided if we adopted a structured national approach to the provision of social care. We should not lose sight of the fact that we will need some 65,000 extra care staff in Scotland by 2020 – so we need to get this right now. - A national sectoral bargaining structure with all the stakeholders; government, employers and trade unions, around the same table. - This forum to agree a national hourly rate for home care, similar to that agreed for the residential sector. - Government to commit to early engagement each year with transparent resource allocation. - A commitment to deliver all the elements of UNISON’s Ethical Care Charter, including the Scottish Living Wage, proper training, an end to insecure work and time to care. In effect this would be a national framework that would allow the Integrated Joint Boards to get on with the task of agreeing local delivery solutions. This would be a sensible balance between the national and the local. Is that really too much to ask for those who deserve a decent standard of care? The Scottish Government's plan for the coming year is light on legislation, but there is more meat in the administrative sections, if it can move from process into action. I outlined the key elements of the Scottish Government's 'Plan for Scotland 2016/17' in a briefing yesterday. So let's step back and look at the plan overall. The main purpose of the plan is to set out the government's legislative programme - it's the Scottish version of the Queen's Speech. There are 14 Bills, but most of them are technical or dealing with specific issues like Domestic Abuse. They are also largely uncontroversial and even Bills on big issues like social security and child poverty are about the process of how the government will administer new powers. The one exception is the Air Passenger Duty Bill. When this tax is devolved, the government wants to halve it with the longer term aim of abolishing it. This plan makes a mockery of the government's climate change commitments by dumping tons of carbon emissions into the atmosphere. It is also unaffordable in the current budget and gives a tax cut to the wealthiest in society - 50% of Scots don't even use air travel. Other promised legislation that campaign groups will want to build on, like the Climate Change Bill and Good Food Nation Bill, have been pencilled in for later in the parliament. Overall, you wonder if the legislative programme would have been more adventurous if the SNP had secured a parliamentary majority in May. Minority government's tend to push more into administrative action, rather than risking parliamentary votes. I suspect the May draft of this plan looked somewhat different! There are two big challenges in the administrative sections. The first is finance. Austerity isn't going away and the next budget will have to set out taxation as well as spending plans. This plan severely limits the government's room for manoeuvre by promising no change in the basic rate of income tax. There are still plenty of opportunities to increase revenue on the fringes, but only the basic rate provides enough income to really challenge austerity and tackle the issues identified in the plan. The second is public service reform. There is a whole section in the plan devoted to how the government wants to engage communities and decentralise. However, the actual measures are pretty modest, like 1% community budgets. On the other hand, we have centralising measures like the regionalisation of education and the ring fencing of council tax. That's before the review of health boards and councils gets under way. There are a number of measures in the plan that could be truly transformational. The main one is increasing early years provision. Doubling the provision with 200 new centres and 20,000 extra staff is potentially huge. The problem is that £500m doesn't meet the cost, unless the plan is to do it on the cheap, with low paid staff rather than properly qualified early year's professionals. Which leads me neatly into social care. It was precisely a race to the bottom in pay and conditions that got us into the mess we are in today. There are new resources to address this, but implementation is a bit of a guddle. Creating a fairly paid, properly trained workforce that has the time to care is absolutely crucial to getting patients out of expensive acute hospital beds. This is an opportunity to put some meat on the worthy Labour Market Strategy by creating sectoral collective bargaining structures for the care sector. This would get all the stakeholders working together to deliver the agreed outcomes. This is crucial to another big element of the plan - shifting NHS resources into community services. This is absolutely the right policy, but very difficult politically. The slightest hint of a hospital closure or even downsizing creates a local storm. The problem for the government is that they came to power on the back of this very type of political protest. Now their financial plans for NHS Scotland look very challenging unless they can free up acute resources. Finally, there are some other positives in the plan. The police officer numbers target has been dropped and replaced by the ‘right mix and numbers of officers and staff’. It will take some time to repair the damage and get back to a balanced workforce, but it’s a start. There is also a commitment to improve value and reduce the cost to the public purse of PPP schemes, including ending contracts ‘where possible and appropriate’. The NHS and some local authorities are starting to get into gear on this after UNISON’s ‘Combating Austerity’ report highlighted potential savings. Equally, the section on inclusive growth and fair work, demonstrates a clear understanding of how unequal societies damage growth. This section includes measures to mitigate the Trade Union Act and support for learning. You wouldn’t see this infographic in a UK government publication! So, the limited legislative programme reflects the challenges of minority government. However, government doesn’t always need to legislate to achieve its policy goals. There is plenty of positive vision and process in this plan – delivery is as always more challenging. Oh to be a fly on the wall at yesterday's UK cabinet away day on post- Brexit planning. 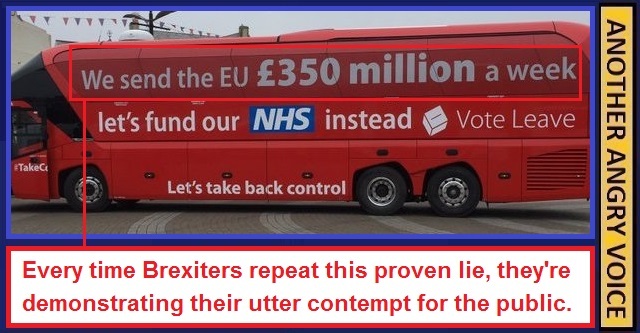 Given that most of the ministers around the table were in favour of Brexit - they will no doubt be outlining how they will spend the extra £350m a week they promised! In practice they will be considering more prosaic options than the Brexit fantasies. As the Guardian reports, some officials at the Foreign Office are pushing for “as much Europe as possible” while others in the Home Office are reluctant to consider full EEA membership or single market access because their priority is an immigration clampdown. And there lies the kernel of the problem. The most advantageous trade deal requires the UK to sign up to most of the EU rules, including the free movement of labour. The very thing the Brexiteers around the cabinet table used to stir up the Brexit vote. Then there is Scotland's lone man around the cabinet table - David Mundell. He will report that the natives are restless, having voted decisively to remain in the EU, and considering options that don't even appear in the hastily cobbled together Whitehall scenario planning. I can offer him some assistance with the UNISON Scotland submission to the Scottish Parliament European Committee inquiry on this subject. In that submission we suggest that Governments should take immediate actions to support the economy and address the concerns of EU citizens living in Scotland. After that, we believe that the Scottish Government should use all its powers to protect public services and human rights, including employment rights. This also means considering all the constitutional options to minimise the impact Brexit could have on Scotland. You can see from this that our immediate concern is for UNISON members who are EU nationals. The obvious first question for me was how many public service workers in Scotland are EU nationals. I trawled around the usual statistical sources and discovered that no one appears to collect this data. For example, in NHS Scotland there is a voluntary staff survey, which given the number of staff who declined to answer, is unreliable. Jonathan Portes at NIESR has been doing some research into this and has published some very interesting initial findings this week. He has discovered that HMRC’s estimate that in 2013-14 there were 2,540,000 individuals who “had a tax record” in the UK and were EEA nationals. In contrast, the Labour Force Survey (LFS) in 2013-14 reported the number of EU nationals in employment fluctuated between 1.45 and 1.62 million. The Annual Population Survey reported 2.15 million, although this includes non-economically active persons. While Jonathan suggests some possible reasons for the difference, it still adds up to a significant discrepancy. More importantly it suggests that we may be more reliant on EU nationals than we think. In our submission, I set out in some detail the reasons why migration is so important to Scotland's economy and public services and therefore why Theresa May’s priorities are wrong for Scotland. Public opinion polls in Scotland and the UK show strong support for letting EU migrants stay. We do not believe that our colleagues from EU countries should be used as some form of bargaining counter in Brexit negotiations. The Scottish Government should also be calculating the costs to public services and the wider economy of the different post-Brexit immigration options, being considered at Chequers. For example, if the UK government decides that free movement is too great a political price to pay for EEA membership, then there would be significant additional employment costs. The current rules for non-EEA nationals include sponsorship and immigration skills charges. If the supply of labour was restricted there will also be workforce planning issues, particularly in health and care, and associated training costs. Scotland will need around 65,000 extra health and care workers by 2020. We don't ignore the various constitutional options and set those out in our submission. However, an early priority should be the very human consequences for EU nationals living in Scotland and Scots living in EU states. This matters for them personally, but it also matters for the Scottish economy and the public services they help deliver.